As our latest social media statistics outline, we have been tracking the daily time spent on various forms of media since 2012. The average internet user is now on social media and messaging services for over 2 hours per day. This shows the central role that social is playing in the daily lives of today’s internet users. As the influence of social media continues to rise, we take a closer look at how this trend has evolved over time. Social media usage is increasing every year. As our research shows, this is a figure that is rising with each passing year. The emergence of multi-networking is a key driver here – the average internet user now has over twice as many social accounts as they did in 2012. What’s strikingly clear from our data is that the internet is capturing more and more of our time each day – with total hours spent online via PCs, laptops, mobiles and tablets growing from 5 ½ hours in 2012 to 6 ½ in 2016. More social accounts = more time on social media. 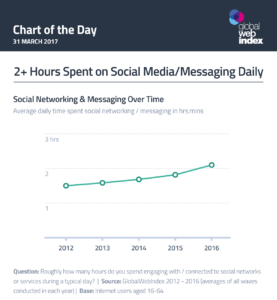 One of the drivers of this is still-increasing levels of engagement with social networking services, which are now capturing 2 hours of online time a day – half an hour longer than they were in 2012. 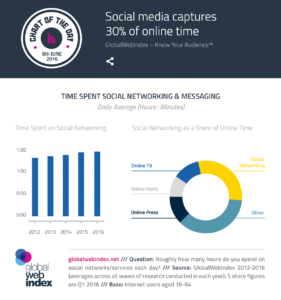 As a share of the time we spend online, these engagement figures mean that social networking now accounts for a third of our daily internet activities. That’s important food-for-thought given how many commentators have been willing to proclaim that social networks will soon reach their saturation point and hit a ceiling. 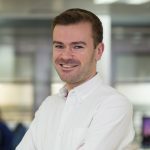 Rather, we’re actually spending more time on networks now than in the earlier part of the decade – with the rise of the mobile internet, and the ability it affords us to connect to networks at any time and from any location, being a major driver of this.